The ancient city of Axum is located in Tigray National Regional State. It is about 1,025 kilometers North of Addis Ababa. The African nation’s historic route begins in the ancient city of Axum, which dates to about 100 B.C. This capital city was the first place in Ethiopia to adopt a new religion — Christianity. According to the Old Testament, The Queen of Sheba was born in Axum, but travelled to Israel to meet King Solomon. They had a son named Menelik, who later became the first emperor of Ethiopia. Menelik brought the original Arc of the Covenant back to Ethiopia from Israel. Today, the Arc, which once housed the Ten Commandments, remains well hidden in Axum. It is guarded by a select group of monks, whose sole commitment is to protect the sacred vessel. Axum is also known for its massive, towering sculptures that are more than two thousand years old. Their significance is still under investigation by archaeologists. The giant stele, the Axum Zion Church the ruined palaces tombs and many other archeological findings are all the symbols of the glorious Axumite Civilization signifying this ancient city as a center of Civilization, religion and Administrative. The fallen obelisk with a height of 33 meters is the tallest obelisk carved out of a single stone. 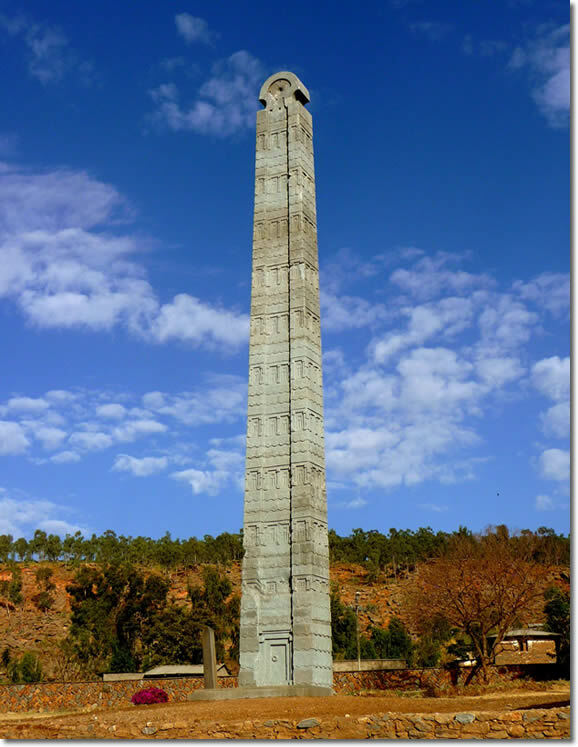 The 24 meter high obelisk is still standing and the other one with a height of 27 meters was cut in to three parts and taken to Rome in 1937 and returned back to Axum in 2005. They are all regarded as one of the finest examples of engineering from the height of the Axumite Empire. Due to its historical value, Axum and its archeological sites were included in the List of World Heritage Sites in 1980. 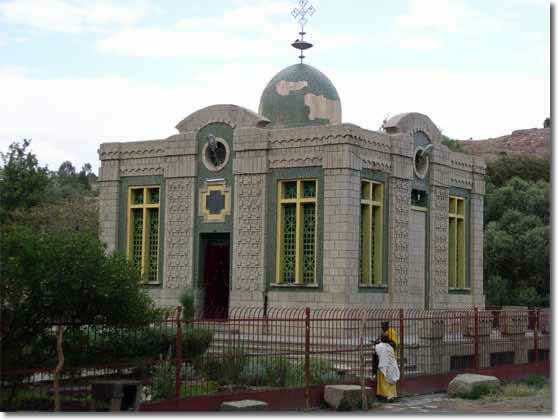 St Mary of Zion ChurchThe 16th century Church of St Mary of Zion is the holiest Christian sanctuary in Ethiopia, and Ethiopians believe that the church houses the Ark of the Covenant, containing the tables on which Moses wrote the Ten Commandments. Menelik is reputed to have brought it to Axum, along with 12,000 Jewish children. The Chapel is constantly guarded by monks, and not even the Presiden t has sufficient authority to enter. The Grave of King Kaleb and the Grave of King Gabre, the reputed Bath of the Queen of Sheba, and a Museum are other historical attractions in the town. The ruins a few kilometres out of town to the north were once the Palace of Sheba apparently. The entrance stairs and floor plan are intact and the Palace had over 50 rooms. The entrance ticket to the sights of Axum allows only one entry to each site but visits may take place over several days. It is essential to bring your own torch to view the tombs.